So a few unexpected things came up during the week that threw a wrench in my read-a-thon plans, but oh well. My first goal was to read 3-4 books. I didn't really meet this goal, sadly. I read Cinder, Glitches, and four stories of Shards & Ashes and the first half of The Invention of Hugo Cabret. So I suppose it totals to about 3 books, I just didn't get around to finishing the final story of Shards & Ashes. So close! Hugo Cabret I finished this morning so I nearly finished all four fully. 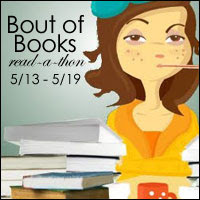 Unfortunately, many unexpected events put me off schedule, and this week will be another busy one with no reading time. That said, I am actually 4 books (5%) ahead, so that's great. Here is my grand total and list of books I read during my first ever read-a-thon! I am hoping to participate in Bout of Books this August but I may be busy during the time. I am looking forward to participating in other read-a-thon's and supporting other people's reading goals!